European frog-bit is a free-floating aquatic plant that resembles a miniature water lily. Leaves are thick, heart-shaped, 1 to 2 inches wide and smooth-edged with spongy, purplish-red undersides. Small, showy flowers are ½ inch across, appear singly and have three white petals and yellow centers. Roots are 3 to 8 inches long and unbranched, dangling from the underside of each rosette of leaves. Plants form a thick mat with tangled roots and runners. 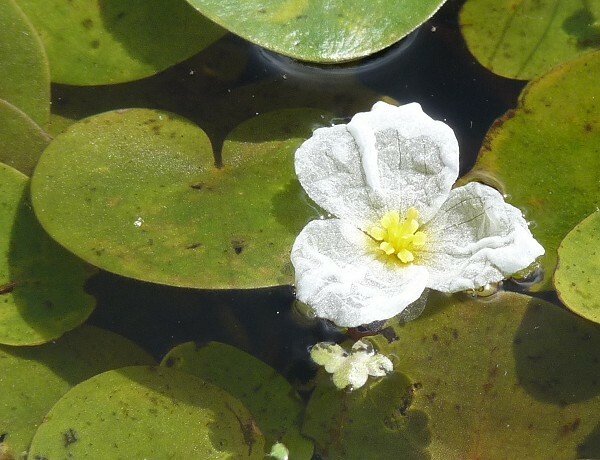 European frog-bit can be mistaken for water lily but its leaves are distinctly heart shaped, leathery. Water lily flowers are much larger, with mor than 3 petals.